Going on an all-inclusive cruise can be a great way to keep to a budget during a family vacation…as long as you know what’s included in your cruise fare and what will cost you extra. Unless you’re a frequent cruiser or a Crown and Anchor member with perks, you’ll want to know what’s included on a Royal Caribbean cruise. You can get the tap water at any bar or dining area, or fill your own water bottle at Windjammer (buffet area). If you go with the latter, you’ll need to fill a glass, then empty the glass into your water bottle. This is a health precaution. You can also order beverages on the room service menu for free, though if you order coffee and juice to your room, for instance, note that you’ll be expected to tip. If you want Starbucks coffee or any speciality coffees in the bars, they will cost you extra. Tip: the free coffee in the dining room is pretty high quality. If you drink a lot of water as we do, you can either refill your bottle with tap water, or use a water bottle with an added filter, such as a LifeStraw Go. If you want cocktails (or mocktails), bottled water, wine, beer, specialty coffee and tea, or freshly squeezed juices, you’ll need to pay a la carte for these items or purchase a beverage plan (more on that below). Cruise guests can opt for either a set dining time or flexible My Time dining, and either will be held at the main dining rooms of your cruise ship. On our Liberty of the Seas ship, you could also eat at the Windjammer buffet (open extended hours), Jade Cafe, Cafe Promenade, Sorrentos, Sprinkles, and the poolside grille that’s open during day time hours. You can also eat at Johnny Rockets for a $4.95 cover charge per dine-in or take-out order. Tip: I was told that Johnny Rockets offers made-to-order omelettes in the morning without a cover charge. I did not experience this personally. Families can upgrade their dining experience to include the upscale restaurants with a specialty dining package, that I think is a good value, though not necessary. Should you get a drink package? At around $45 per person, per day for the ONLY drink package that includes alcohol, buying all the adults packages can add up fast. Is it worth it? Do the math to see if it’s a value to you: we found that cocktails were around $10-12 each, and wine was about $8-10, so you broke even after about four drinks per day. That’s about two more than I usually have, so for me, it wasn’t worth it. Note: The package is only $45 if you order it online before your cruise; later it jumps up another 20%. There’s a lesser package that includes soda, bottled water, juice, and specialty coffees and teas, but again, I found that I wouldn’t use it enough: I don’t drink soda and could get the coffee, juice, and water I needed for free. Lastly, there’s a bottled water only package, that I would only consider if you must have bottled water instead of filtered. Can you share a drink package? No, but…well, yes. It’s against the rules, but certainly I have seen reports of people doing it. You could have one person order cocktails, wine, or beer (or bottled water for that matter) for more than one person at bars. At dinner, you’d be out of luck. Can you bring drinks or food onboard? No, with the exception of two bottles of wine per stateroom, in your carry on, at embarkation. Again, I have certainly seen people break this rule, but personally don’t think it’s worth the risk. Do you have tips for new cruisers? 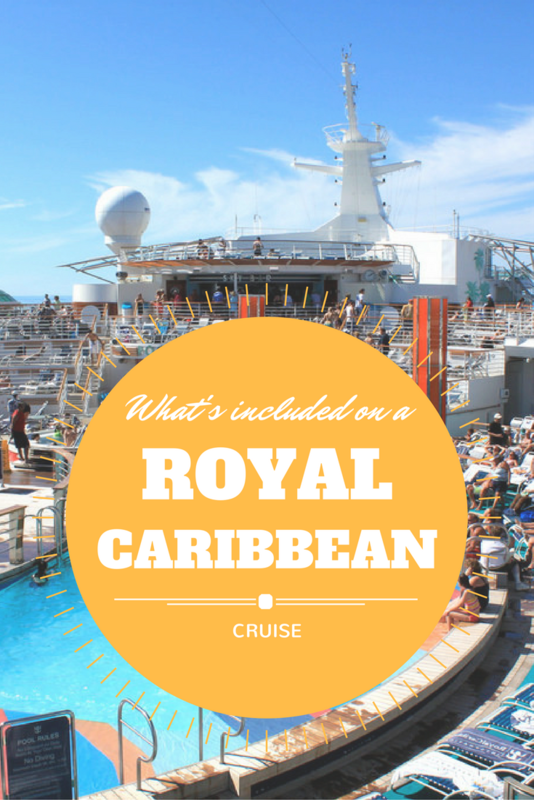 What’s included on a Royal Caribbean cruise?